There are exactly 200 restaurants participating in San Diego Restaurant Week this year. So far, I've only been able to make it to one: The Prado at Balboa Park. It wasn't until we were seated beside trees on the outdoor patio that it occurred to me I couldn't remember how long ago it had been since I'd seen The Prado at night, and even on those occasions, I was seated in the lounge area, enjoying live music and the bar menu. David and I think of The Prado as a location for special lunches. After all, that's where we went directly from the courthouse the day we eloped. The trees, the fountain, the little birds, the bougainvillea; it all has a fairytale quality to it. At night, strung lights add a festive flair. We were in the park for an event at the Reuben H. Fleet Science Center, an opening party for the new Great Balls of Fire exhibit. It was the first warm night after a cold snap that lasted for weeks, a perfect night for wandering the park. So, after the event at the Fleet, we strolled over to the Prado for dinner. I ordered a bottle of wine solely for the name. "It's like me," I said. But David disagreed. He laughed and shook his head. "You are not a pessimist," he said. "You may think you are, but you're not." 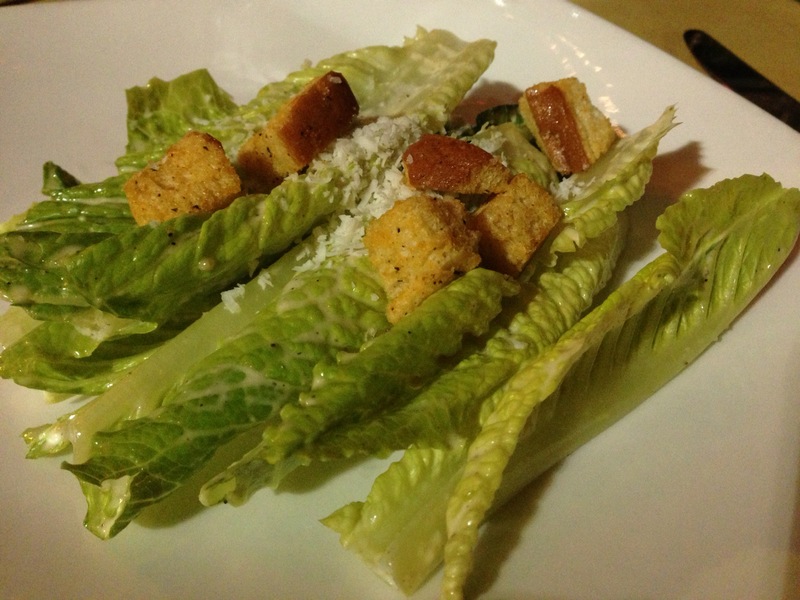 David got the "Prado Caesar," a simple salad with romaine lettuce, croutons, and poblano chili caesar dressing. Though he said he couldn't really taste the flavor of the poblano, there was a little bit of heat on the finish. My spicy calamari fries, a dish with which I was familiar, was as solid as ever. The tender slices of calamari were served hot -- the high temperature combined with the serious kick of the Korean chili sauce warmed both my body and mood. The fresh, cool slaw beneath it was the ideal complement. David's been having a tough time finding duck he likes lately. 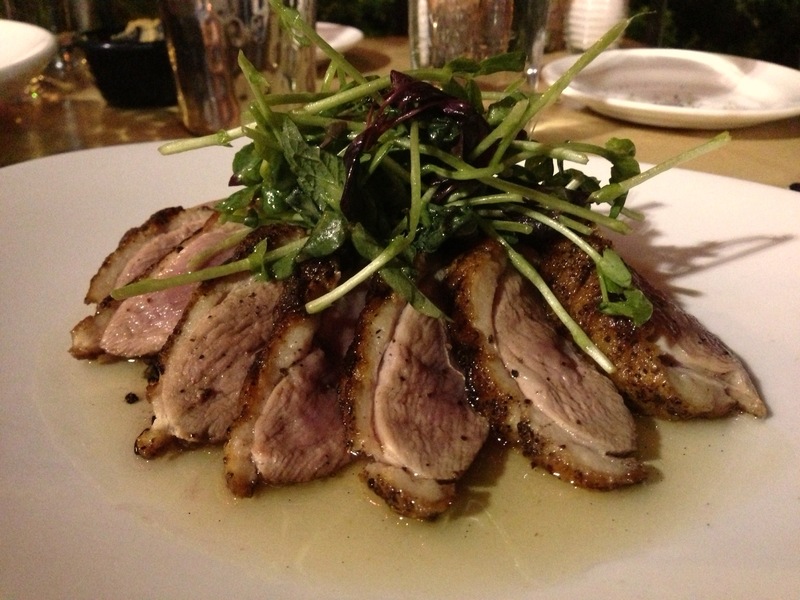 Here, the duck was served with caramelized pineapple sauce. David thought the dish as a whole was overly sweet, overwhelming the flavor of the duck. I got the red wine braised short ribs. I was pleased to find that a gentle hand had been used on the horseradish in the mashed potatoes. The saltiness of the spuds paired well with the tender beef. We rarely get dessert when we're there for lunch, but since it was part of the deal, we both opted for our favorite, the cream cheese flan. 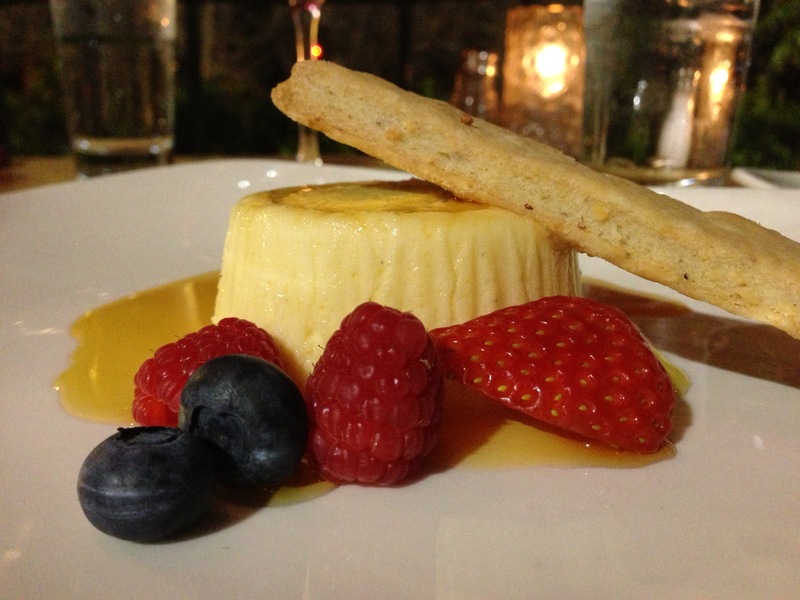 Traditional flan is a little too gelatinous for me, but this version gives it a creaminess that is somewhere exactly between cheesecake and flan. It's served with fruit and an almond cookie, and a light sugary sauce so tasty that David was sure not to leave any on his plate. Unlike most of the other restaurants, The Prado (and all of the Cohn Restaurants) extends restaurant week into two weeks. So though "restaurant week" technically ends tonight, you can still sample this pre-fixe menu for lunch or dinner through next Friday.